Cover fit – how hard can it be? When you are buying your own clothes, do you just go to the shop grab one off the rack and stick a belt around it to make it fit?? No! You get to try on your purchase and there are several garments to choose from because the manufacturers know that everyone is not the same shape. NOT SO FOR OUR POOR HORSES!!! I have tried canvas ones with jute lining which keep the horse’s coat very dust free but do tend to rub at the shoulder. It would seem that they are made too big in the neck area for some horses. In past years I used to measure my horse / pony from in front of the withers to 3 inches beyond the tail, and also from the wither to the centre of the neck where the buckle would be. I’d take these measurements to our local saddler who then made the cover to fit. There was very few who were rubbed from this method, but of course they would have most likely cost a bit more than the ones you can get off the rack these days. A cover combination that seems to work. This horse in the photo with the badly fitting mixtures of cover tends to be quite narrow in front, leading us to believe she would need a narrow fitting cover, but these rubbed her quite badly. However, the colourful ensemble she is wearing seems to be fine for her without any more rubbing. I have just received an email from a person in the UK who has, through frustration from ill fitting covers, designed her own. Who can blame her for taking it into her own hands and designing covers to fit her type of horse. It is great to see that innovation is alive and well in the horse world, and there is an alternative to mass produced goods. A cover designed by a British horsewoman who was tired of covers that didn’t fit. Well … I agree … how come most covers have shoulder darts closer to the elbow than the shoulder?? What is it with neck covers these days! My horses by no means have giraffe necks but when they put there head down there is more neck poking out than is covered by the supposed “neck cover”. Have solved the problem though by adding onto the end the end of last seasons summer white cotton number. But still when you pay for a neck cover is it too much to expect it to cover the neck!!!!! 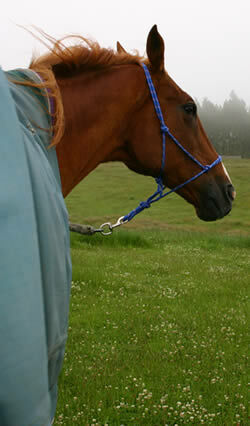 One of our neck covers was so long it covered the horses ears, though that I admit was when he was not grazing. I think that he actually liked it so long.